Definition: Acute Otitis Externa ( also known as "Swimmer's ear") is diffuse inflammation of the skin of the External Auditory Canal (EAC). It is caused in most cases by Pseudomonas aeruginosa or Staphylococcus aureus. Streptococcus and Proteus are also involved. Fungi like Aspergillus and Candida species are more common in tropical areas and in patients who had previously taken wide-spectrum antibiotics. - Swimming, especially in fresh water. - Eczema, seborrhea and other dermal conditions. - Continuous use of cerumen buildup and hearing aids. 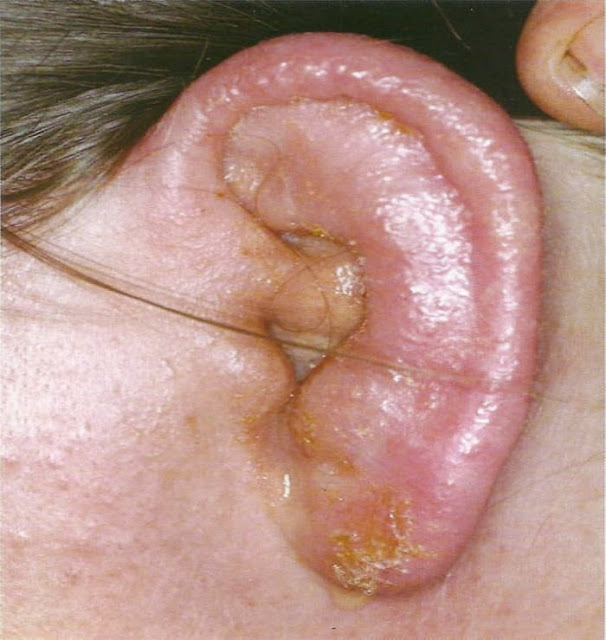 Those factors cause loss of protective cerumen barrier leading to epithelial disruption which allows inoculation of bacteria then increase in the pH of EAC. - Decreased immunity as in diabetic patients. - Mild trauma from itching. - Severe pain (Otalgia) on mastication. - Deafness due to edema. - Scanty purulent discharge (otorrhea). - Tenderness on moving the auricle or tragus. - Diffuse redness and edema of EAC. - Use oe earplugs during swimming. - To remove water from ear e.g after swimming, it is recommended to use "air dryer" at the lowest setting while tilting the head. - Avoid self cleaning or scratching the ear. - Use of Acetic acid 2% otic solution (Vasol) 2-5 drops after exposure to water. - Aural toilet (Suction or dry mopping). - Packing the External Auditory Canal with gause strip soaked with Glycerine icthyol, or steroids and antiseptic like Kenacomb cream. as discussed in Localized Otitis Externa.